The bid to name an anonymous peak in Fiordland National Park Mt Tolkien in honour of The Lord of the Rings author has received backing from a prominent member of the society dedicated to his work. Manapouri man Aaron Nicholson has lodged a request to name the 1757-metre summit in the Earl Mountains, near Lake Gunn, with the New Zealand Geographic Board. The peak appeared briefly alongside other Fiordland National Park locations in the Lord of the Rings film trilogy. Nicholson hoped that naming the summit, close to Consolation Peak, would provide a lure for Tolkien fan tourism in the wake of the release of The Hobbit movie. 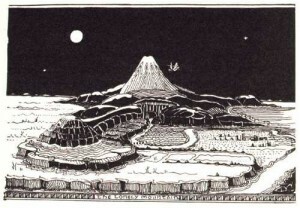 The Tolkien Society, founded in London in 1969, is an international body devoted to the author’s works. It is regarded as one of the most important groups dedicated to Professor Tolkien’s canon. Its education officer, Dr Lynn Forest-Hill, said she liked the idea of naming the mountain, but could not speak for the society as a whole.